Anyone who has passed Coliseum Square has seen its spectacular fountain, but very few realize that the existence and operation of the fountain is almost entirely dependent — not on some city department — but on the consistent manual labor of a few dedicated volunteers from the neighborhood. 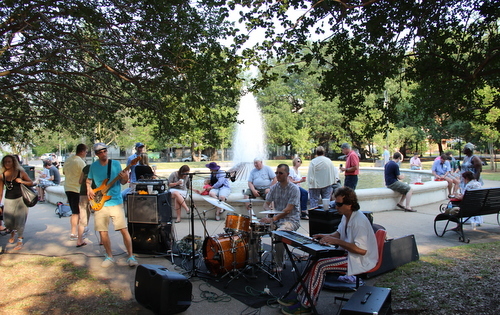 This week, at the monthly meeting of the Coliseum Square Association, parks committee chair Bettine Carroll took a few moments to acknowledge the men and women who keep the fountain running and the parks clean. Below is Carroll’s speech to the committee, reprinted in full. 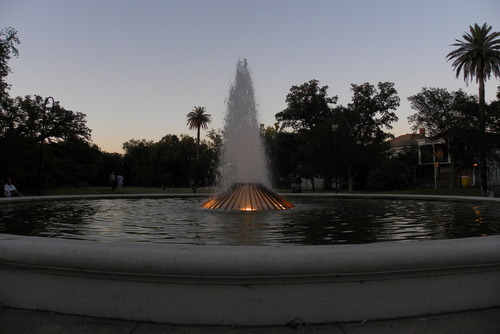 We currently have three volunteers who maintain Coliseum Fountain. These volunteers spend a minimum of 253 hours per year (that’s 84.3 hours per man per year) working on Coliseum Fountain. Every Monday, rain or shine, during boiling hot or freezing cold weather, Grayson Fleming, spends approximately 1 and a half hours cleaning Coliseum fountain. Every Wednesday, Andrew Yon does the same thing. And every Saturday, it’s Fritz Westenberger’s turn. Andrew has been doing this for at least 10 years, Fritz for 2, Grayson for 5 (with a one-year break, during which Derek Brown filled in). At least five times a year, all three men converge on the fountain and perform a deep cleaning. This includes draining the fountain, vacuuming the basin, clearing it of algae, dirt and dog hairs, as well as other maintenance-related things that I don’t understand. This process takes all three men approximately three hours. That’s nine hours of labor on those days. Occasionally, like when a homeless person decides to use soap to wash in it, the fountain gets shut down, drained, and the lengthy three-hour process that requires all three men begins. Andrew Yon is the most mechanical of the group. So, when there’s a mechanical issue, Andrew either fixes it or, if it’s beyond his capabilities, calls in the professionals, meets them at the fountain, and waits with them while they fix the issues. This can take days. Recently, the auto-fill timer went out. Andrew tried to fix it but couldn’t. So, while these volunteers waited for a professional to come in and fix the problem, Andrew, Grayson and Fritz went to the fountain every single day for six weeks to act as human timers. They checked the water level, adjusted the solenoid valve, and ensured that no motors broke. Derek Brown, our former Parks Committee chair, is the Coliseum Fountain back-up man — on call whenever Andrew, Fritz or Grayson cannot be. For around 10 years, he was one of the key members of the maintenance rotation. You may remember that on Christmas Eve three years ago, he got stuck with a needle during his weekly routine. So again, by my math, these men spend a minimum of 253 hours per year— a minimum of 84.3 hours per man per year— working on Coliseum Fountain. That’s not counting mechanical mishaps or acting as human timer controls. Barbara Eilers cleans our catch basins regularly. Malise Dennard has only missed one clean-up day that I am aware of and, because she had to miss it, hired a yard man to come in her place. Malise walks the park several times a week and picks up and sorts the recycling and trash while she does. She and Mary Len Costa, of their own initiative and without telling anyone, recently scheduled their own private clean-up day, where they weeded the grossly overgrown surrounding of Birth of a Muse. If Barbara Eilers is unable to work a park clean-up day, she still shows up and makes sure we have all the tools and equipment we need. Steve Kern is considered our muscle man. Steve Striffler lives in Boston, but comes to our clean-up days whenever he is in town, claiming it is for Jeanne’s cookies. Kara Renee is now in Florida, but is always available by phone or email to help and give advice. A woman named Renee, who lives somewhere on the corner of Euterpe and Coliseum Streets, stores half of our dog waste bags and replenishes them as needed. Karon Reese stores the other half and also replenishes them as needed. I, myself, have a box, so I know how much room these doggie waste bags take up. Over the past several weeks, both Julie Simpson and Jeanne Stephens have devoted countless weekday hours to prepping Lafon for restoration. Their hard work has easily saved the CSA Board $5,000. These are just a few of the Parks Committee’s super humans, who work often and hard without any expectation of acknowledgement. I hope that when we see them next, we will all go out of our way to thank them for all that they do. For more information about the Coliseum Square Association — which represents the entire Lower Garden District — see their website at getlowNOLA.com.